NOTICE: Product upgrade- The screen frame has been replaced with a queen excluder so it can be used for both purposes! 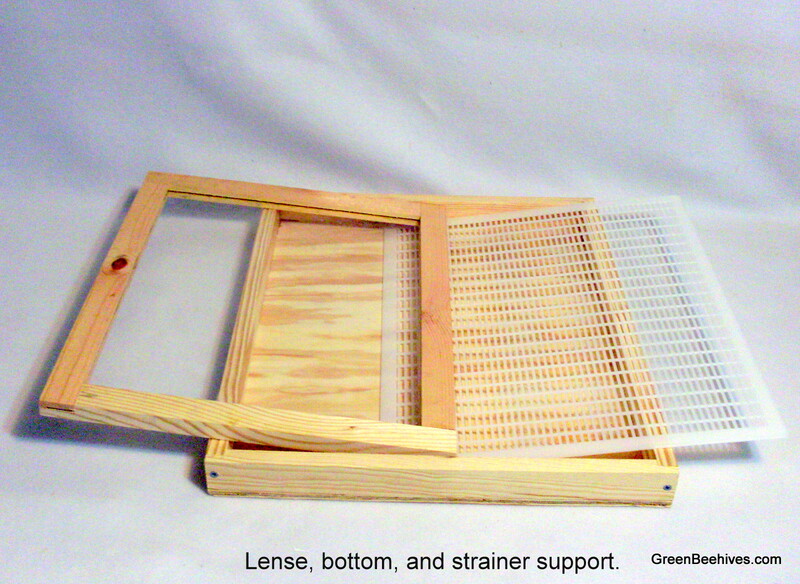 This set includes a plexiglass cover to let the sun in and retain the solar heat, a queen excluder to hold the cappings for melting, and a bottom board to set your aluminum tray on. Available in 8 or 10 frame size. You need to furnish 2 supers, paper towels, a large aluminum tray, a plastic pitcher, funnel and bowl. Instructions: Place your aluminum tray on the bottom board in the set. Set the your first super around the tray. Put the queen excluder on top of the super, and cover it with a few strong paper towels. Then, place the second super on the towels. Add the wax cappings from the super you harvested in the center of the paper towels, and cover with the plexiglass. Place the unit in direct sun lite from mid morning to mid afternoon on a hot summer day. When the wax and honey have melted and drained through you will have only slum gum left on the paper towels which you can then discard. The tray will have a pretty creamy yellow wax mass and a puddle of golden honey. You can use another sheet of the paper towels and the plastic funnel setting in the pitcher to separate the honey from the wax. The wax can be placed in a plastic bowl and floated in simmering pan of water. It will melt into a clear liquid, but when it cools down it will change back to the creamy yellow you saw in your aluminum pan. DO NOT leave the wax unattended while melting. If the water in the pan boils away the plastic bowl and wax will burn. Only use simmer setting to heat the water the plastic bowl and wax are floating in and remove the bowl with wax carefully when the wax is clear. It is HOT, and so is the water!